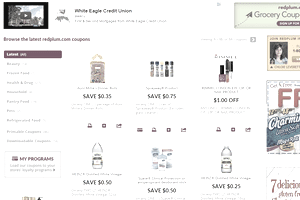 ••• © Valassis Interactive, Inc.
Redplum Coupons are just one type of free printable coupons that will help you save at the grocery store, drug store, and your favorite restaurants. Redplum coupons for groceries will help you save money on grains, baking items, beverages, breakfast, canned goods, condiments, dairy, frozen foods, household items, baby items, organic groceries, pet products, produce, seafood, and snacks. Redplum has drug store, restaurant, and local coupons but they're best known for their printable grocery coupons. At at recent visit to Redplum I found coupons for frozen breakfast sandwiches, frozen entrees, pasta sauce, lemonade, cereal, popcorn, marinade, dog food, protein bars, cinnamon rolls, and tuna. Visit Redplum and click on one of the categories on the top of the page to view grocery coupons, drug store coupons, restaurant coupons, or local offers. Click the boxes underneath the Redplum coupons you'd like to print. You can use the page numbers at the top or bottom of the page to scroll through all the coupons. When you have selected all the coupons you want to print, click Print Selected. If you haven't printed Redplum coupons before you'll need to install the printing plugin by following the on-screen directions. Your coupons will print and they are ready to be cut out and used. Read the small print on the Redplum coupons to find out the requirements and expiration date. Check with your local grocery store to see if they accept printable coupons.